Emails show Carson and his wife selected the furniture themselves. 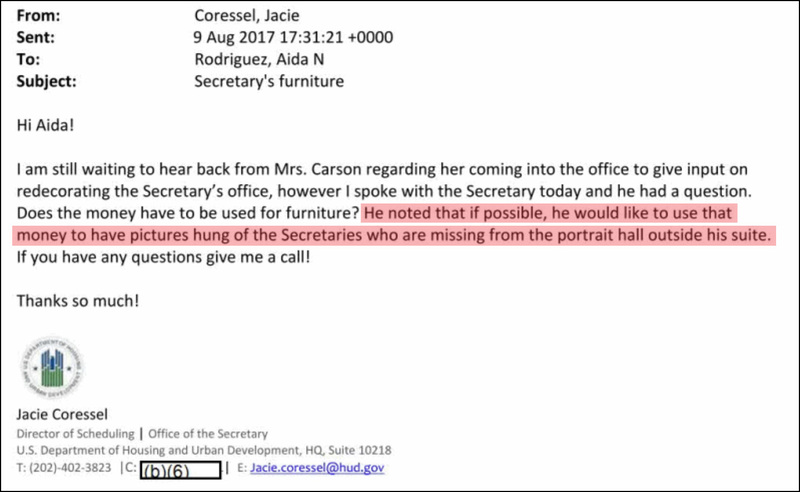 An August email from a career administration staffer, with the subject line “Secretary’s dining room set needed,” to Carson’s assistant refers to “printouts of the furniture the Secretary and Mrs. Carson picked out.”…The career administration staffer sent the quote to Carson’s office, specifically Carson’s chief of staff and his executive assistant, casting further doubt on the agency’s assertion that the purchase was made entirely by career staff. There’s nothing really wrong with any of this. Why lie about it?